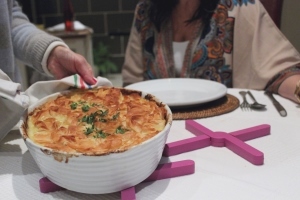 The NEW StayPut Silicone Trivets are ideal for preventing hot pans, casseroles or serving dishes from marking, burning or damaging kitchen surfaces and worktops, or the dining table. Made of 100% silicone, they are heat resistent to 240 degree, and do not conduct the heat from the pan or casserole through to the under surface. Even if direct from the oven. Dishwasher safe, the simple folding design means they can be neatly stored in a drawer, so also ideal for small kitchens in caravans or boats. Available in two colours: Lime Green and Purple.